Death follows Miss Fisher and Dot on the train on the way to pick up her flash new car. The gruesome murder of a passenger gains our detective her first official client, and a cast of oddball characters, including the victim's daughter, the husband of the deceased's former patient, and a pair of charming university boys, are somehow involved. Detective Inspector Jack Robinson and his second-in-command, Constable Hugh Collins, display their usual lack of shock at finding Miss Fisher in the middle of their investigation. Fur-collared garments abound; Miss Fisher's "shoe" displays unusual abilities; a stowaway is discovered; and Phryne liberates (or kidnaps) most of the prime suspects in the case with her usual aplomb and the help of a brand-new Hispano Suiza. Meanwhile, back in Melbourne, Miss Fisher has secured a new residence, complete with a seemingly dour butler. The episode closes on Phryne persuading DI Robinson to share a drink to celebrate her new ward. I loved the part in this episode when she has trouble climbing up the water tower--I like how tough she is but it's nice to see her have a clumsy moment and handle that with grace, too. "They say this car's top speed is 85 miles per hour, but I bet we can get it to go faster." As promised, I am going to flail about how Jack and Phryne should clearly kiss. Jack is married, true, but the sexual tension is already present and climbing, and we're only two episodes in. Their moment together at the end was lovely. I loved that it was, for the first time, Phryne and Jack letting go of their roles: it was a brief moment where Phryne wasn't the meddlesome and flirty lady detective and Jack wasn't the staid, rule-enforcing detective inspector. They were instead just Phryne and Jack, with some of their guard let down, attempting to make a more genuine connection. Also, we talked about Phryne's clothes last episode, but can I just say, Jack's suits are also pretty great. Nathan Page cuts a fine figure in those suits and that coat and that perfect hat. - The Hispano Suiza was the first sports car. - I always wonder exactly how shocking Phryne really would have been for the time, considering this was the era of petting parties. - A few 1920s cocktail recipes to accompany your viewing. There's a great interview [minor spoilers] with the costume designer where she mentions that's on purpose-- they knew since Phryne was going to be in approximately 5,000 different outfits per episode, they needed everyone else to be wearing the same sorts of things every time, as a visual anchor. Hence Nathan Page's nicely cut suits! One of the things I'm enjoying about the show is the Australian setting. I'm getting to learn more about the country as I watch. For example, the titular town of Ballarat is an inland town, 65 miles from Melbourne, where the majority of the action in the series takes place. Both are in the state of Victoria (for which the adjective is of course Victorian). Something else that is really striking to me is how English the upper class Australians sound in the series. I listen to a lot of ABC podcasts, and I don't hear this kind of accent there, nor did I hear it when I visited Australia. Is this accent a thing of the past in Australia? Something that has faded out in more egalitarian times, much in the same way that the upper class accent once associated with the northeast United States has faded away? I was curious about the accents too, so I did a little digging: there's some pretty cool examples of "cultivated Australian" accents on this page from the early 20th century. My super-untrained ear can tell the difference from regular British accents, barely, but it's much less distinct. I think Greenwood got it exactly right when she set Miss Fisher in the 1920's; it's in this delightfully apropos period where a wealthy but not ultra rich woman was still expected to have a personal staff, which frees up a lot of time for things like murder investigations and being well-dressed all the time, but finally also allowed enough freedom for women to do things like live on their own and drive and take lovers not-entirely-discreetly. If Phryne had been born twenty years earlier, none of this would have been available to her, and if she'd been born twenty years later, she might have been expected to run her own household. Similarly, if she were any less nobility she wouldn't be able to move in such high circles; but if she were any more nobility, her movements elsewhere would be more constrained by the need to represent the family as heir. Minor obscure nobility and quite wealthy but not from money is the only placement that would work for her, I think. Indeed, I think there's an interesting vein of nouveau riche threading under Phryne's character. She likes flash stuff-- sparkly dresses, lots of champagne, fast cars, airplanes-- all of which back up the idea that she didn't grow up with money and that now she has it, she's enjoying it (unlike Aunt Prudence, who acts as though she's always had it and that's just the way things are done.) The idea of having a job or a career, even if you don't need it to support you, was probably also something instillled in Phryne by having relatively working-class parents; Aunt Prudence, it's later revealed, spends almost all her time working as a high-level charity organizer, but it's not her identity: Phryne is a Lady Detective all the time. Note that this is all wild speculation based on the TV show-- haven't read the books. I was less engaged by the mystery in this episode than the first one. I think perhaps because since it started on the train, I was expecting a "locked room" type of setup and got a bit thrown off when this proved very quickly not to be that. That last scene between Phryne and Jack was definitely the highlight of the episode for me. 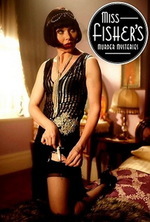 At the moment, I'm kind of hoping they won't go too hard with the "will they won't they" but I like that they're letting the characters warm up to each other a bit so we're not necessarily endlessly looping through the same interactions every time Miss Fisher starts investigating a new murder (ie: basically every episode).